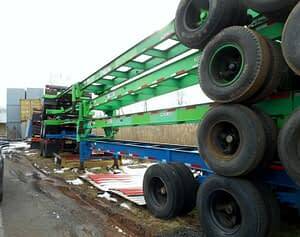 Sale Inventory includes: 20ft Flushbacks, 20ft Sliders, 20ft Tri-axles, 40ft Goosenecks, 40ft 8-pin locks, 40ft – 45ft Extendables, 40ft Tri-axles. Chassis are sold “as is” if you have a mechanic or are exporting. Chassis are sold in Roadworthy FHWA condition for safety with domestic use. New and Used sale inventory changes so keep in touch. Ro-ro service unavailable, TRS can insert chassis in a container. TRS can assist with New Special Order Chassis ie: 30ft Generator Chassis. TRS offers support: Registration, Repairs and Parts. We can stack, chain and transport chassis stacks. Click on a specific unit type for more details.